Located a 20-minute drive from Dieppe Castle, Yourte en Normandie features a furnished terrace with BBQ facilities, garden and children's playground. It is just 20 km from the beach. 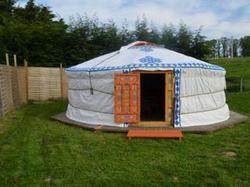 Influenced by Mongolian design and colours, this yurt offers a seating area and wardrobe. The private bathroom is located just 2 steps away. A continental breakfast is available and can be served in the dining room or on the terrace. Guests can also make use of the communal kitchen, which includes a stove, microwave and refrigerator. Just a 2-hour drive from Paris and 30-minutes from historical Rouen, the property boasts free private parking. Canoeing and karting activities can also be found a 20-minute drive away. Featuring Mongolian inspired décor, this yurt offers a seating area and wardrobe. The private bathroom is located just two steps away and includes a shower. You will have access to a shared kitchen. Please note that price is based on 2 guests. Maximum occupancy is 6 people, additional charges will incur (see conditions).